The Reboot option restarts your router by turning it OFF and ON. When rebooting the router, all the devices that are connected to it will be disconnected but will automatically reconnect once the reboot process is finished. The Reset option, on the other hand, erases all the settings on your router and sets the router back to its factory defaults. It will allow you to reconfigure the router from scratch and create new settings based on your network setup. NOTE: These options are only available if you are locally connected to your Linksys Smart Wi-Fi Router’s network. Why is rebooting or resetting the router important? It is important to reboot or reset the router to fix certain issues that you may be experiencing with the router. NOTE: It is recommended to first try to reboot the router. If it does not fix the issue, you may reset the router and reconfigure it. Launch a web browser and enter your router’s IP address, "192.168.1.1" or “myrouter.local”, in the Address bar then press [Enter]. NOTE: The Linksys router’s default IP address is 192.168.1.1. If you have changed it, use your customized router’s IP address instead. For instructions, click here. On the navigation pane, under Router Settings, click Troubleshooting. On the Important pop-up box, click Yes. NOTE: Observe the Power light on the router when rebooting. It should blink or flash as an indication that the router is going through the process. Wait for a few minutes to finish the process. 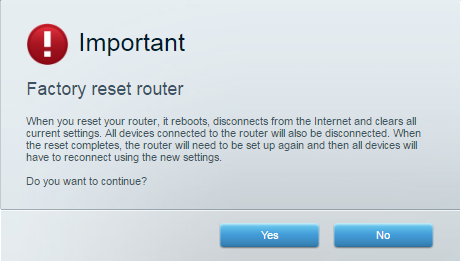 On the Router Reboot pop-up box, click Ok. NOTE: If you want to manually reset your router, just press and hold the Reset button for about 10 seconds while the device is still powered ON then release. All configurations that have been made on the router will be erased after resetting the router. NOTE: The router’s default IP address is 192.168.1.1. If you have changed the it, use your customized router’s IP address instead. For instructions, click here. NOTE: The Power light on the router should be blinking or flashing as an indication that the router is resetting. On the Router Reset pop-up box, click Ok and close your browser.